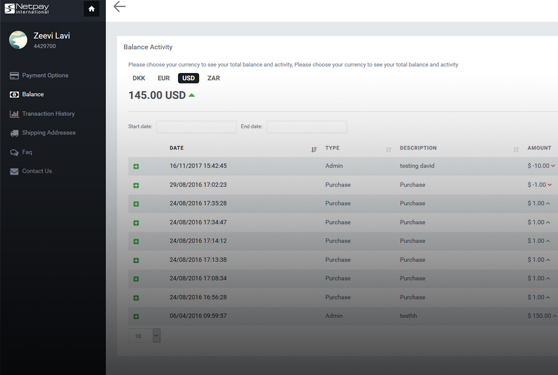 The Merchant control panel subsystem is a website that allows merchants to view their account balance and manage their account. This subsystem incorporates a master / child user security model that allows merchants to create sub accounts and control their specific permissions for the master account. 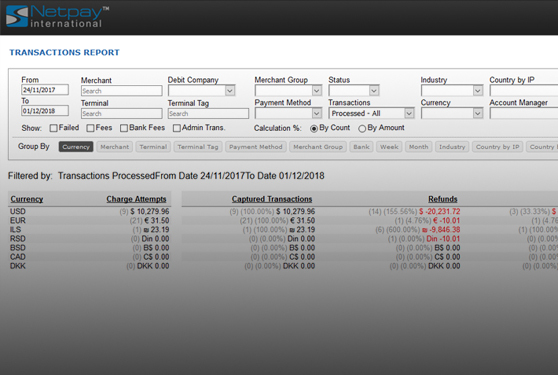 With this interface the merchant can response to retrieval request notifications, ask to wire money from his internal account to outer bank account and ask for refunds on behalf of his clients. He can also see communication and other various logs of his account. The administration interface components are an intranet site that includes many administration controls and pages to control and admin the entire system. The interface incorporates a sophisticated security model to allow individual users to preform only specific actions. Permissions system allows Role/Group/User selection model. 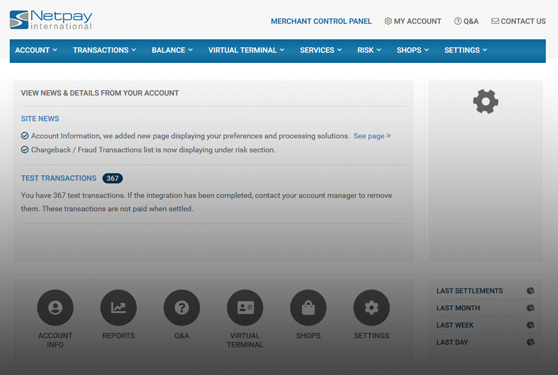 The merchant developer center subsystem is a website that allows merchants to configure their service configuration. It also includes all the documents and other information and resources required for merchant side developers to integrate into the system. The documentation is updated on the fly per merchant by the services configuration it has. This interface also allows clients to change their integration security token which is a long system randomised value use to calculate SHA256 and MD5 authentication signatures. Wallet is an advanced online payment service by OBL. We provide you with an innovative platform where you can personally manage all of your online money transaction. By using this payment processing service you can ensure the safety of your merchants, clients and all money transfers. Wallet is suitable and highly recommended for online vendors, auctions sites and many other commercial users. THE merchant hosted solutions are set of merchant services that enable the merchant to integrate easily with only few lines of code. These services are web pages that are shown to the end user in specific payment scenarios. The hosted solutions contain the following services: - Hosted Payment Page where the merchant redirect the end user to a secure payment page, when payment is required. - Hosted Public Pay which is a merchant setting list of simple products that the end user can select from and then proceed to check out in the hosted payment page. - Hosted Card Storage which allow the merchant to create a token based credit card association for future charge (note that this service only works if the underlying processor provider supports card storage service). 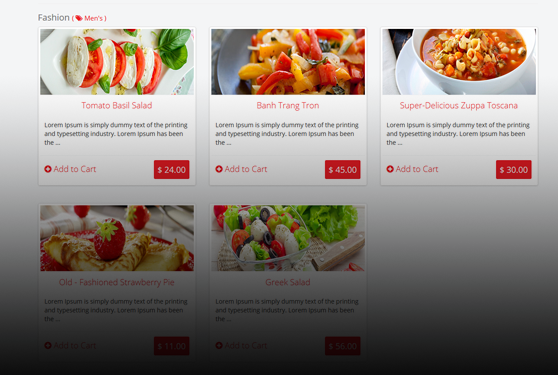 - Hosted Cart which allow simple web site to manage a basket with a very simple integration. 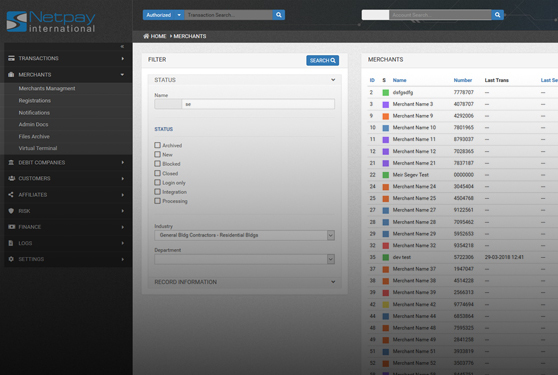 All the hosted solutions can be skin customised to allow clients choose the “look and feel” of the page. Clients can also control various data fields. All of these customisation options are available via developer center. 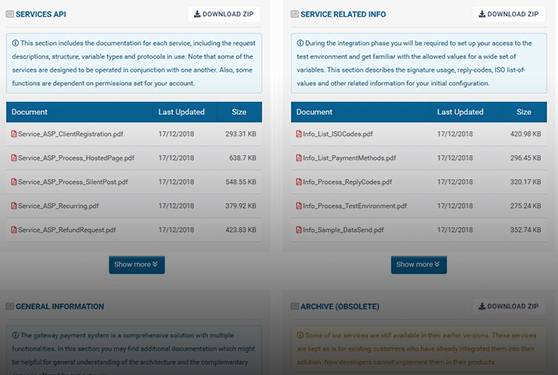 The reports portal subsystem is a web reports interface which allows you to query and produce rich and accurate reports from the processing data. Depending on the configuration, this demoralised database can be located on different Microsoft SQL servers to reduce system load. The system comes with easy to integrate SQL packages that demoralise the data deliver and persist it on the reporting database. with simple SDK resources to distribute to 3rd party application vendors. 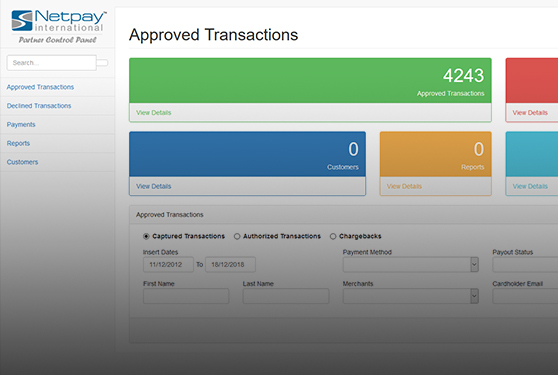 The partner control panel subsystem allows a partners and affiliates to view the account balance of their merchants. It also allows them to view their fees and browse their previous settlements. Partners in OBL system holds a balanced account in the system, they can login and see their virtual account any time. Each merchant can be referenced to up to 2 partners. The affiliate subsystem allows you to set partner fees to different events in the transaction processing cycle per merchant or per payment method. All this fees are eventually summed to produce the partner settlement. OBL has become one of the leading forces of the IPSP industry. We hold vast experience in website development, software development and creating custom made solutions for online shops. Today we are a one stop shop for anyone who wants to establish his own marketplace. We will plan, design and execute online shops based on an innovative infrastructure and marketplace management system combining our unique payment gateway platform. This enables our global clients to easily manage multidirectional payments while comply evolving regulations. OBL advanced business payment solutions provides companies and small businesses with online capabilities for managing worldwide money transfers. In fact with MiniTV every business can easily conduct money transaction anywhere and anytime. This service transforms your device, laptop or computer to a legal way for online transaction. By issuing each business with its personal unique link they can now easily and quickly transfer money in a secure and safe way. OUR journey began more than 5 years ago, as a small software house we developed softwares and web sites when the internet was still at his early years. With time we progressed and started developing our own gateway system, the small software house then took a path to become one of the leading IPSP in the industry. We believe in experience, and with that in mind, we perfected our gateway software to a point in which we can offer companies the option of using our Gateway Package in order to setup their operation. 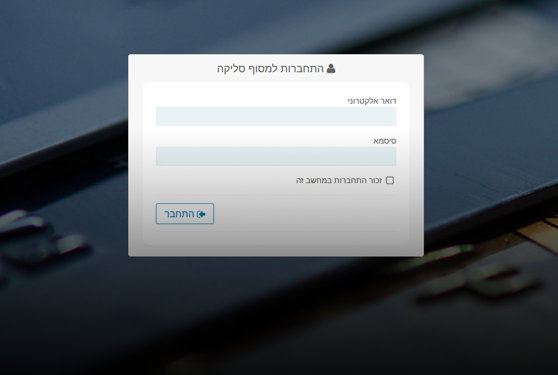 5 years and millions of transactions later, we are starting our new journey, we like to look at our new venture just like a “Startup with 5 years of experience”, one of our first joint ventures was an exciting one, we teamed up with Partner, the Israeli operator of the mobile brand “Orange”. Our Mobile Merchant application became the software of choice for the cell phone company, and after re branding our Mobile Merchant app the “quick sell” product is ready to go. We look at every new deal as a new partnership, our services never ends just by selling our software, it is merely just the start. The process of installing and integrating the system to different banks and payment solutions is only a small part of the services we offer our clients. Our clients can choose from different support packages depending on their needs. OBL is not your typical SAAS (Software As A Service) company. Our experience helped us understand that great service helps us transform our system from a good one to a great one. Payfinder provides worldwide merchant payment solutions for a wide range of industries. The company offers all-inclusive services for E-Commerce, Payment Gateway and credit card processing. These services are provided while giving its clients a range of benefits, making business worthwhile. OBL feels honored Payfinder had chosen us as a partner for its global activities. Launching a company is never an easy business but Coriunder helps companies do it faster. They provide their clients with all the solutions and services for them to manage their company from one enterprise level solution. We were glad to provide Coriunder with technological solutions they implemented that proved to be part of their success. YoManE was established by the Ngena Foundation that facilitates life changing services. The idea behind YoManE is to ensure that the funds raised by the foundation are properly used for specific purposes. This unique platform enables other organizations and entities know their funds are spent as intended. We at OBL found this an important cause for our technology, services and solutions. Over the years we have collaborated with worldwide companies that needed our cutting edge PSP solutions, in order to increase their own success. Panda Payment Solution Ltd. (PandaPSP) is one example. The Hong Kong based company is a payment facilitator that provides secure and efficient e-commerce payment acceptance tools for worldwide merchants such as credit cards, AliPay, Wetcher, vouchers and more. Founded in 2009 PBT initial purpose was to provide IPSP services through its PCI compliant payment gateway. Today Pay By Tech operates in two fields: PBT Online processing, providing global IPSP services .The second is PBT Payment Solution, specializing in worldwide POS terminal acquiring services. Since established PTB found OBL as a trustful partner providing cutting edge solutions for the company's needs. With over 20 years of experience Service Net has become one of the warranty industry leading providers. The company provides full range solutions and services including warranty management administration, extended service programs, customer service support, service network management, claims processing services, and service contract underwriting. Service Net is part of American International Group, Inc. (AIG) and we are proud to be part of their success as the company has chosen to implement our PSP solutions. TENFORE was established in Serbia in 2001 providing simple and safe online money transfer services. Since then the company has grown to become a leading force in the entire region helping its partners improve their performances. Today TENFORE is a Western Union Official Agent and from 2015 the first Payment Institution in Serbia. OBL is proud it was able to be part of TENFORE's journey to success while providing services and solutions along the way. Netpay International is a global provider of online payment gateway solutions. Established in 1998 it has quickly became an industry leader as a one stop shop offering its own flexible state of the art platform, personally customized to clients' needs. Today the company holds partnerships with over 100 acquiring banks worldwide. It was our privilege to collaborate with such an appraised company and be part of their success. Netpay Braדil provides its worldwide clients with advanced online payment gateway solutions, based on its own state of the art platform. All solutions are custom made in order to maximize the platform's advantages per client. It was our pleasure to collaborate with Netpay Brazil and expand our global partnerships in South America. More then 20 currencies are currently supported by the system, the currency conversion is done instantly and accurately. During the years we have teamed up with third party providers and by using their services we have been supporting more then 42 payment solutions. Our system is capable of integrating to multiple banks, enabling our clients and their merchants a wider selection of payment solutions. OBL’s systems processed more then 600 million dollars in last 5 years. More then 10 million transactions have past throw our systems and been analysed by our risk algorithms. All of our products and services are PCI DSS level 1 approved, we are working hand in hand with Comsec to ensure we are compliant in every way. 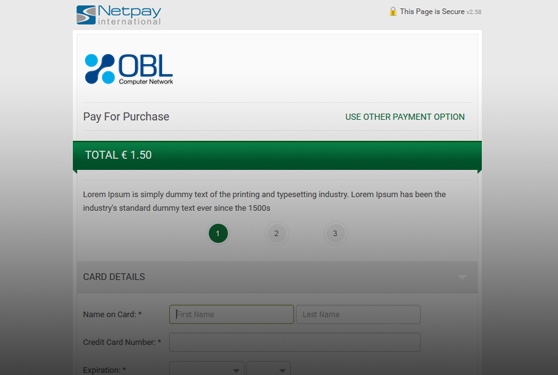 OBL specialises in mobile and online payment platforms. Alon is an accomplished entrepreneur, with years of success in building businesses from the ground up. He began his career in the billing industry in the early 90’s, in New York, where he acquired a taste for system and network administration. This helped him return to Israel and establish Netpay, with one goal in mind; help millions of people around the world navigate the Internet and make their transactions for products and services safer, faster, smarter and more reliable. 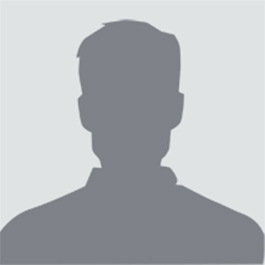 Mr. Lavi is the chief technology officer at OBL and has been with the company for over 20 years. As such he has spearheaded the development on all of OBL/Netpay’s most complex projects, most notably our real-time credit card processing system now being used by some of the top most internet base service providers. Zeev started his professional career in 1998 as a senior developer at Compunet Ltd., a top Israeli leading company in web development. Mr. Patimer is UI expert designer specializing in client-side design and implementation of financial and e-commerce Internet websites. He has extensive experience and thorough knowledge with the aim of achieving optimal results in the adaptation of the design planning according to the advanced digital marketing. Mr. Forte is a full stack developer specialized in web technologies. He is our youngest team member, coming straight from the IDF where he acquired his experience serving in a technological unit. He participated in many complex projects which required script writing, automating business workflows and building web portals. He is very interested in the FinTech industry and loves trying new technologies, and open source frameworks in particular. Feel free to contact us at any time, if you need a development team we are the team for you. Address: 11 Ha-Sadna'ot Street, Building B 2th floor, Herzliya, 4672839, Israel.